When you think of ninjas, you usually imagine a stealthy, lightning-fast killer that blinks from place to place within the shadows. 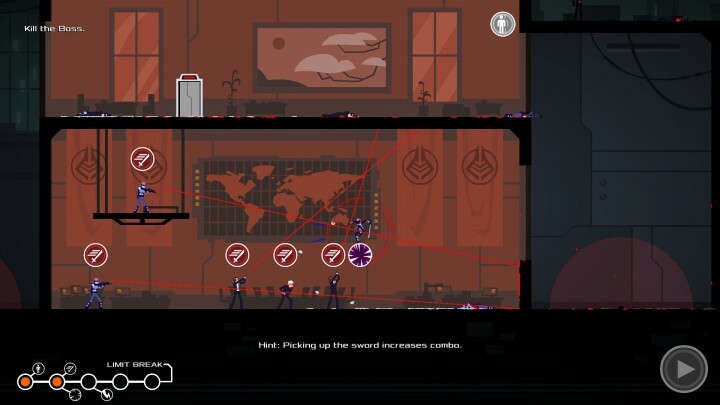 RONIN‘s take, however, flips these notions around with a turn-based approach to ninja action. In RONIN, you’re encouraged to mercilessly slaughter all of your enemies head-on, dispatching them one by one with your trusty katana. 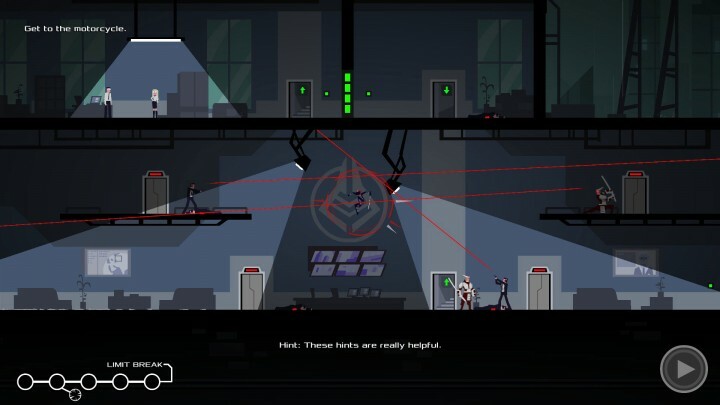 During combat, each second becomes a moment frozen in time; in RPG-like fashion, you can carefully select your next move, such as jumping to the ceiling to avoid gunfire or activating a rain of shuriken. 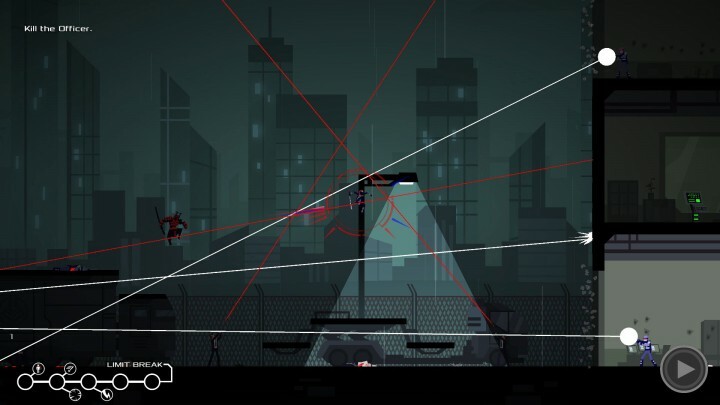 It’s this innovative puzzle-like approach to action platforming that makes RONIN a satisfying game. But, when the gameplay mechanics are stretched too thin, frustration and boredom can start to creep in. Thankfully, RONIN is short enough to not wear out its unique concept, and it’s an experience that’s well recommended for the cerebral action gamer. RONIN has you hit the ground running jumping right away. You’re immediately plopped into the game with no backstory other than “go kill these five people in this photograph.” You’re then sped through a few quick mini-tutorials, covering the basics of jumping and stunning/killing enemies. It’s already obvious that RONIN takes a lot of inspiration from the game Gunpoint, at least superficially. But within the first few levels the game clearly distinguishes itself with its core mechanics, playing more like a puzzle/strategy game. It feels great to execute stun-kill combos in rapid succession while dodging hails of gunfire. Combat is turn-based, so when you’re spotted by an enemy time freezes to let you pick your next move. You’ll need the breathing room too, since enemies fire bullets with pinpoint accuracy, clearly marked by bright red lines. You’ll have to determine where’s the best place to jump to in order to both avoid these bullet paths as well as setup close-range kills using your sword. Once the concept clicks, it feels great to execute stun-kill combos in rapid succession, dodging hails of gunfire with agile jumps as you pick enemies off one by one. This isn’t simply a game of “find the safe space” though. New enemy types are quickly introduced within the first few levels, adding considerable challenge by restricting your options. Get caught jumping next to a ready-stance samurai or carelessly fall into the multi-turn machine gun fire of an officer and it’s instant death. Since RONIN is not really a stealth game (an in-game tip even says so), you rarely have the option to hide and pick off stragglers to even the odds. Instead, you’re often forced into situations where you’re surrounded by enemies who all instantly target you, and the amount of bullet lines can feel overwhelming. Generally, this results in a lot of trial and error before you can figure out how to survive a room. Successfully do so though, and you’re rewarded with a gratifying sense of accomplishment. There is a small point of frustration in the early game, and that’s the design of the skill system. To unlock skills, you need to obtain skill points from completing all objectives in a level. This is easy enough at first, but eventually gets quite difficult, specifically with the “avoid lockdown” objective. A lockdown is triggered after 10 seconds/turns of being spotted. In addition, if a civilian is the one who spots you, you cannot kill them to prevent lockdown as another objective is to “not kill any civilians”. With some levels having many enemies spread far apart — some in direct sight of civilians — killing them all before a lockdown happens can sometimes feel impossible. Even when you do gain access to a few skills, they’re cumbersome to use. Each skill is assigned a different activation point cost, and each action (e.g. stunning/killing an enemy) gives different points. But if you don’t use your points immediately, you lose one each turn. 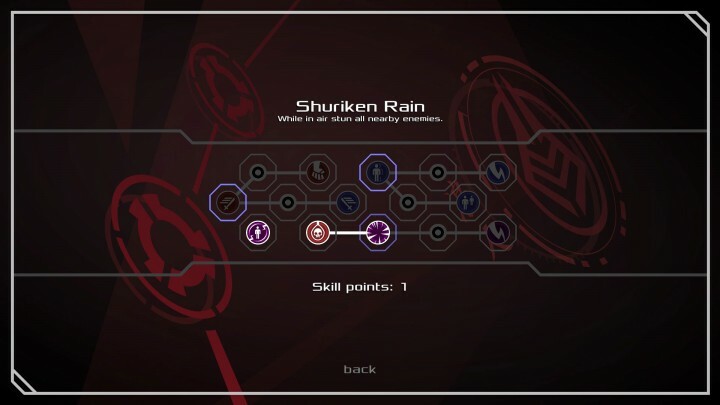 For example, if you want to set up a shuriken rain to stun the whole room, you need exactly two points and to be in the air at the end of a turn. This usually requires stunning an enemy, killing them, then jumping far enough to stop mid-air without touching another platform. If you can’t meet all of these requirements — due to avoiding other enemies’ bullets, the room being too small, etc. — then forget about using that skill. On the other hand, even if you manage to stock up lots of points from chain kills, you can’t use them exactly when you want to. The limit break ability is auto-cast at five points, emptying your points bar for an extra turn you may or may not have needed. However, even with these misgivings, there are moments of “cool” to be had when unleashing skills on your foes, and they’re fun to use when you’re able to. RONIN gets noticeably more difficult midway through the game. 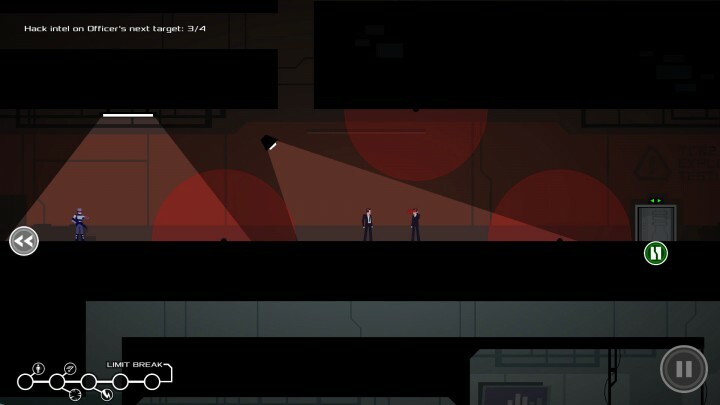 Civilians are scattered more frequently throughout each level, and indestructible spotlights shine down on nearly every room. As a result, there’s more stealth-like planning needed to avoid triggering a lockdown. Also, you can no longer simply kill enemies and leave their dead bodies in plain sight. You must wait for the right opportunity when a civilian isn’t looking, then skillfully jump-tackle an enemy so that they fall outside of a spotlight’s lit area. This added complexity in progressing through levels is welcome, but there are times when the required timing and precision are too tightly tuned. Further increasing the difficulty are the introduction of traps and large open areas, restricting your positioning options. There are fewer walls and ceilings to cling to, and even when they’re available there’s the danger of deadly mines. Instead of linearly cleaning out rooms like earlier stages, there’s more strategy and possible approaches to kills. However, this often results in a lot of frustration as well, like when you’re facing off against enemies who are two or three screen lengths apart, or forced to stay in a tiny area to avoid instant death by explosion. Excessive backtracking and retries can get grating fast. As battles get more complex, frustration can set in when a single mistake can undo dozens of well-executed actions. This results in a lot of backtracking, as checkpoints can be set far away from your next objective. 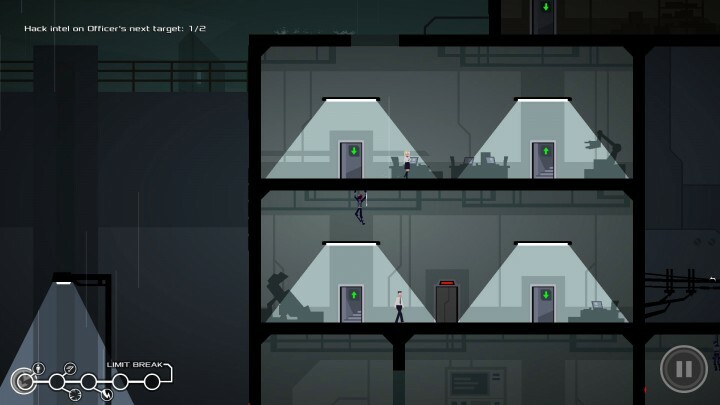 There’s a distinct imbalance of fighting versus traveling, where you can spend minutes stuck in an elevator or running through empty hallways for a few seconds of total combat. The boss battle with the Officer is a particularly good example of these frustrations. You’re confronted with a dozen enemies in a giant area with hardly any hiding spots or ledges. Death is common, and the retries required to successfully pass this section can get grating fast. If you’ve been taking the time to obtain skill points, here’s where you’re rewarded for your effort. Even though skills are obtained through optional mission objectives, by the end they feel required to really bring out the gameplay’s potential. With more enemies in each room (which are enclosed thankfully), it’s much easier to quickly stack up and use skill activation points. Unlike the early levels, skills don’t feel as restricted since point deterioration becomes much less of an issue. Having constant access to group stuns, teleports, and ranged attacks lets the turn-based combat system shine. Skills control the flow of battle, and without them combat would feel dull and frustration would be frequent. RONIN‘s end game is ultimately a mixed bag. Unlike the Officer levels, rooms are smaller and allow you to really think through each battle scenario, conquering levels piece by piece. It’s during these last levels where the feeling of being a ninja comes out, and it’s great fun when things click. However, the final level has no checkpoints, forcing you to complete it in one shot. This can get quite frustrating as there are dozens of enemies between you and the final boss — death means starting the level over completely. Successfully beating the game unlocks New Game Plus, but it doesn’t change enough to invite a replay. For example, machine gun fire now moves towards you instead of firing straight. There aren’t any new skills to learn either, so there’s no incentive to complete objectives. It’s just a mode with more challenge for those who want it. It’s a cerebral game at its core, rewarding thoughtful planning instead of twitch reflexes. When RONIN works, it really works. Somehow slowing down ninja action to one turn at a time makes battles feel even more visceral; with kills planned out several moves ahead, each movement makes you feel like a true assassin hunting prey. It’s a cerebral game at its core, rewarding thoughtful planning instead of twitch reflexes. It’s unfortunate that a few gameplay mishaps add frustration to the experience. The odd skill system, excessive backtracking, and brutal precision requirements could have used some more polish. Regardless of these blemishes though, RONIN is a unique and immersive take on the action platformer genre.